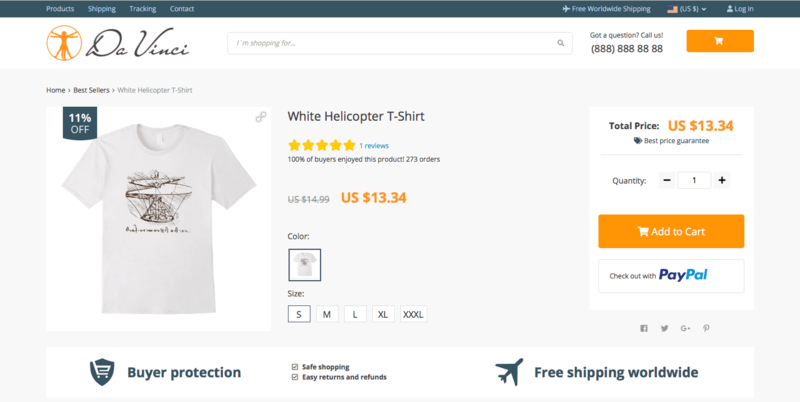 Why does it matter what WordPress theme you use in your AliExpress drop shipping store? Because the better your store looks, the more sales it generates! 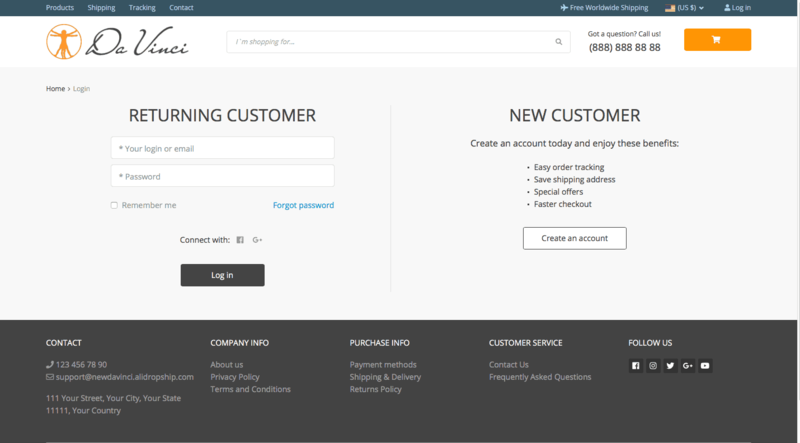 Today, we will talk about new, customer-friendly AliDropship theme. So, let’s give a round of applause for Da Vinci 2.0! You probably remember our Da Vinci store theme. Historically, it was the first theme we have offered to our plugin users and custom store buyers. It is so good-looking and appealing to visitors that most of our clients choose it for their drop shipping stores. Plus, we actively use it ourselves: most of our self-owned stores are based on Da Vinci. And, these online stores have a great performance! This is why we can be sure that the Da Vinci theme is efficient and well-working. However, many years have passed since we introduced this theme. For this reason, we decided to take the best from the original Da Vinci theme, and improve it! Now, we are proud to announce Da Vinci 2.0 – a new WordPress theme for AliDropship stores that combines time-tested solutions with cutting-edge tricks! 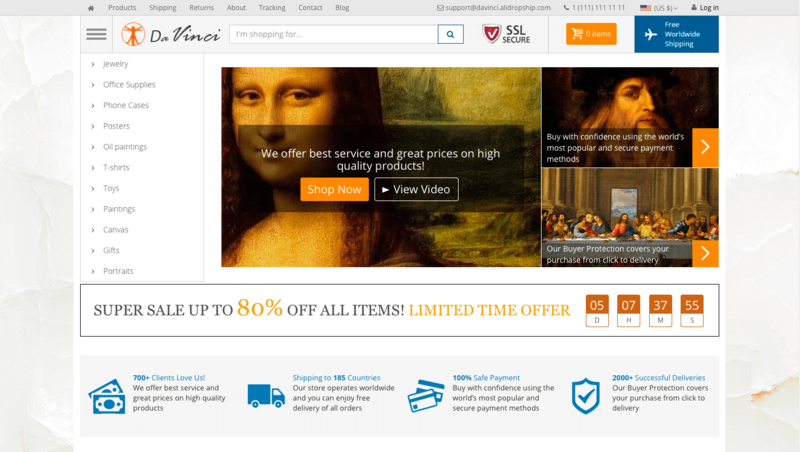 Why is Da Vinci 2.0 such a great WordPress theme for AliExpress drop shipping stores? 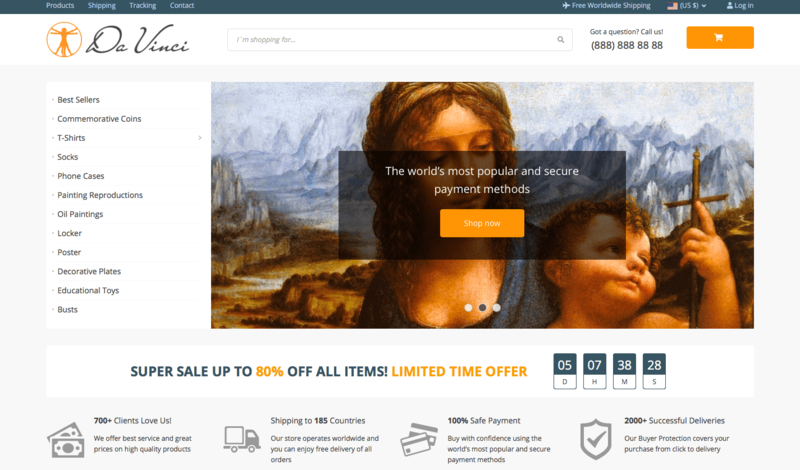 So, Da Vinci 2.0 (you can view it in detail here) is an awesome WordPress theme for AliExpress dropshipping sites that are built with our plugin. Please note: this is not an update to the original Da Vinci! It is an independent theme! You might ask: why is it so special? Here are the most significant and valuable features of this theme! Don’t worry – all the vitally important buttons, links, and tabs are still here. We are not getting rid of essential website elements! However, we locate these on-site elements in a carefully thought-out way. This way, the pages on Da Vinci 2.0-based websites don’t look overloaded and confusing – instead, they are neat and tidy. The visitors can find the necessary information easily, and they don’t get lost in the navigation. To understand what we’re talking about, look at the screenshot below – it’s the layout of a homepage on the original Da Vinci theme. Yes, it’s cool – it’s catchy, decorative, and highly entertaining. Still, it can be done in a different, equally (or even more) efficient way. You can almost feel the difference, right? The content is the same, but the way it is presented is strikingly different. The new version has much more clean free space, less details that require the viewer’s attention, and a very comforting ‘tone’ overall. Obviously, it has a huge importance for our next point! A human attention span is really short, and it literally takes you seconds to lose your focus. In our new Da Vinci 2.0 theme, we did our best to put the product into spotlight and make sure it’s not overlooked. As you can see it here, not a single element on this page distracts the visitor from the product. For this purpose, we have increased the size of the main product picture, changed the way the price is displayed, and designed a clear “Add to cart & check out” box. All these tiny steps are vital if you want to grab your visitors’ attention and guide them towards completing the order! Right now, you might be wondering: why would the product page viewer complete the order, after all? What should you do to make the visitor click the ‘Proceed to Checkout’ button? Psychologically, there are numerous tricks that can speed up the decision-making process. In the Da Vinci 2.0 theme, we use some of these methods. 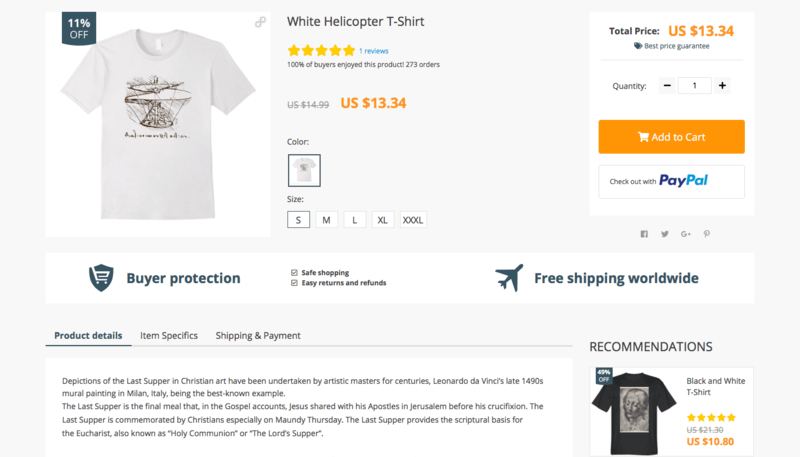 Let’s take a look at a single product page once again – now, from a slightly different angle. The first thing that the visitor sees is the sale badge (“11% OFF”) placed directly on the product image. You probably know that elements placed in the top left corner of reading/visual materials are the first ones to grab our attention. Here, we use this principle to make the buyers believe they can make a good deal. Another important element is the Reviews link. Right after the product name, customers can see how much did the previous buyers like this item. That’s vitally important for quality social proof! Besides, the Reviews link is clickable, so the page viewers can use it to go straight to the feedback section on the same page of they are interested. Finally, in the Recommendations column, your store guests will see up to 5 related products that can make a good match with this exact item. Surely, it’s a great way to give your clients more shopping ideas and increase your average volume of orders! You certainly know how annoying it is when you can’t complete an important process on a website because of its inconvenient structure or unclear directions. Imagine how many potential buyers you can lose because of a poor user experience on your website! Luckily, Da Vinci 2.0 theme doesn’t simply provide a smooth operations flow. In a way, it also cares for the website visitors, and lets them know they are welcome and valued in the store. Surely, it only creates the best impressions about the business! It all starts with the login/register page: whether the user is a new visitor or a returning customer, it is easy to figure it out how to log in and proceed with shopping. It was also important for us to make sure that all the other on-site systems are conductive and understandable. For example, if the store visitors look for something that is not featured on the website, they won’t simply see a plain ‘sorry, no matches found’ text or something. Instead, they will see recommendations on their search wording. Besides, they will also see 10 best selling products from the store – maybe, it will inspire them on impulse purchases! The attention to customers’ input can also be seen in the way we treated the new “Write a Review” forms on single product pages. After the buyers leave their feedback, they see a “Thank You” notification that definitely proves their importance for the store! As you have probably understood it by now, the whole Da Vinci 2.0 theme is centered around the buyers. Clearly, its aim is to provide a smooth shopping experience and urge the visitors to come pack for more purchases! So, it doesn’t simply create a clean, well-structured website that meets the modern standards and looks relevant. It shapes a welcoming, supportive environment where every visitor feels valued and appreciated. Isn’t it what we all want, after all? Let’s go over the major benefits of this WordPress theme for AliExpress drop shipping stores once again! Now, you’re probably wondering how to get Da Vinci 2.0? Once again, it’s not an “update” to the original Da Vinci – it’s a totally independent theme that should be installed separately! To get this theme, simply click here and press the ‘Download theme’ button. Follow the theme installation guide if necessary. After this, feel free to use the theme customization guidelines to create a unique and appealing shopping destination. Now, you’re ready to proceed with your awesome business. Don’t forget to leave your feedback in the comments’ section below! The FIRST Free WooCommerce Dropshipping Theme From AliDropship Is Now Ready! Does it mean that the theme on my site will get disabled after I download the Da Vinci 2.0 theme? No, you just can switch between themes, the old theme will be fine. I am using Raphael. Will I need to change any settings before or after installing the Da Vinci 2.0 theme? You can change product titles of course, but as for the theme it is not translated to brazilian portuguese yet. Hi, I would like to know if this theme works with the alidropship woocommerce plugin. I tried to download the plugin to my word press, but the plug fails. Can you send me a current link for me to download it please. Can I actually use it if I have Alidropship Woo Plugin? This theme can only work with AliDropship original plugin, not WooCommerce. Also I did some testing and there is NO field to enter Discount Code in the Checkout. Also, is there an option to switch to one page checkout instead of having 3 pages? These are very important. Thanks! Probably this option is not activated on your settings. I really like the new theme. Good Job ! If I install new theme, will I have to re-import all products? Hi, no you will not need to re-import products. Last week, I just received a custom store, setup by your team. I asked him same question but he said, No you will have to re-import all products and will have to do full customization. it is like a setting up a new store. Could you please share the list of required customization? Hi, no, it works only with the original AliDropship plugin without WooCommerce. However we are working on development of the Davinci for Woo. If I am ordering a custom store, can I ask for this theme to be used in my custom store? I tried to download the plugin to my word press, but the installation failed. Can you help me with this download or send me a current link for me to download it please. does the DaVinci 2.0 new theme support putting Categories as boxed tiles at the home page like the “Most popular categories” section on the http://raphael.alidropship.com/ demo ? Hi, I am using davinchi theme I want to change to davinchi 2.0 How can I change it without losing products and plugins. Hi, you can just change the theme, you will not lose anything. we are currently on davinci original theme, is there any detail guide to migrate from davinci1.0 to davinci 2.0 ?? from the article what i understand is just install davinci2.0 activate it & its done , am i right ? what about all the customization, product page setting, main menu structure, will every thing remain as it is without any impact , or we need to again do any customization to the entire webstore look ? pls confirm . Thanks. i have migrated to davinci2.0, after migration i found that not all customization option & images settings got automaticaly imported to new theme, i had to manually setup up every thing all images, all options in cutomization, etc & much more to all people who want to migrate, please mak sure you have backup of all images & remember settings in davinci1.0 customiation. Also, on single product page, social share buttons should have een made colorful, the plane greay icons looks un appealing, how to change the color? also how to bypass shippping method selction page since we are going free shipping method we want to skip this page & never showup, how to skip this step, where are settings for it? Do you have such an option. I read a few times but did not get any detail. Please advice. Thanks. Vijay. Currently we have an option to add cross-selling items to your products to show them on your product pages. How do I do that? Please advice! and Thanks for help. Go to Product Options -> Cross-Selling and add there. But I don’t want to do product by product. I am planning to put more than 10, 000 products on my website, doing product by product is simply not possible for me. I read your message carefully, but I probably was not clear in my answer. Currently we have ONLY the option to add cross-selling items to your products to show them on your product pages and you need to do it one by one. Thanks! I am sure your customers will love to have a faster solution to apply cross-selling! following is written about cross-selling. Is the line “If thee are…..shown as related!” not applicable? This line means that if I don’t select products for cross-selling, random products will be shown! That is exactly I am looking for, but is not happening ! Appreciate your response. Thanks a lot. Hey, Yaroslav, I see that in the new update of Da Vinci 2 theme, this “recommendation” feature is working without setting up any products for individually. This is a great feature, d thanks a lot for taking care of it that fast. Commendable speed of improvement. Thanks! Issue resolved! Yes, you need AliDropship plugin installed to use the theme. Can I use this theme for any niche. Yes, you can use this theme for any niche. Somehow it seems like on mobile devices the (sub) category images are very very small so the overview doesn’t look very good. Is there any way to change how those thumbnails are displayed on mobile devices? Hi, solution may be simple and I must missing some thing. How to install demo content on Da Vinci 2.0 template? after installation I am getting blank front page with “Front Page” title in mid area, below the header.